Moving to a new place requires you to prearrange things and plan them accordingly. It can be stressful, so, imagine moving with your doggie who can get disturbed easily. A change in environment or routine can spoil the mood for both of you and probably wreck the entire process. Therefore, follow the below tips for moving with your dog and how to keep him happy. Before the move: You will need to prepare your pooch for the move. For this, you can take him to the new apartment frequently along with being in regular touch with your dog’s veterinarian. This will ensure that he is healthy and ready for the final move. What’s more, try and maintain the dog’s regular schedule as much as possible. During the move: Reduce the apprehensions of your dog by petting him constantly. Give him his favourite meal. He needs to know that he is loved and you care for him immensely. In fact, when you call the moving company to move out stuff, make sure the journey is a comfortable one and he is relaxed. Sometimes being uncomfortable also makes them uneasy. If you think it will be a tiring move board your doggie at a day care, kennel, or with familiar friends. After the move: The most crucial step is settling in. Therefore, after you have settled in your main duty will be getting him used to the new place. You can do so by placing recognizable toys and treats close by. Take your pooch for a walk and keep the routine as normal as possible so that he does not feel left out. You can even use a distinct scent of your old home because the familiar smell will help form a sense of comfort. 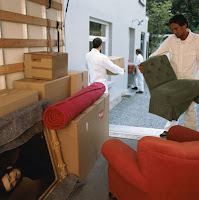 The process of relocation is indeed an exciting yet a stressful time. While we know why we have transferred it is hard to explain to our furry friends the need. Be patient and let him adjust in his own sweet time. It may take days or even weeks to get comfortable, but as long as there is love, reassurance, and trust, the dog is sure to be alleviated.